How close can you come to copying Street Fighter II without getting sued? Back in 1993 Konami seemed curious to find out. Tournament Fighters is a 2D fighting game based on the Teenage Mutant Ninja Turtles license. 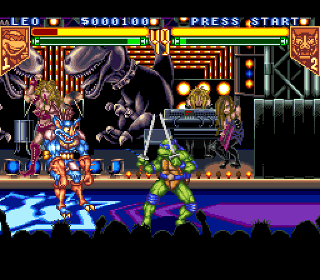 It includes 10 playable fighters plus 2 bosses; the Turtles themselves, Shredder, and 7 characters I’ve never heard of. On top of the obligatory tournament mode, there is also a needless story mode which does little more than put your opponents in a particular order and inject a minimal amount of storytelling between bouts. The game uses only 4 buttons, two each for kicking and punching, and much like SF II includes several special moves for each character. In tournament mode, there is a second meter underneath your life meter that fills incrementally for each strike that hits your opponent. When it fills you can unleash an “ultimate attack” whose damage dealt makes it unfitting of the “ultimate” moniker. Inexplicably, this feature is not enabled in story mode. As a child of the 80’s I was a huge fan of the original cartoon, so I’m disappointed with the character lineup of this game, and doubly disappointed with the absence of Rocksteady and Bebop. A better selection of fighters beyond the 4 main characters would have been Casey Jones, Splinter, Shredder, Krang, maybe Usagi Yojimbo, and obviously Rocksteady and Bebop. Ultimately, I’m just not sure who this game’s target audience is. It’s too challenging for smaller kids who were more likely to be fans of the Turtles, but back in 1993 if you were a fan of Street Fighter II, then you were going to play that instead of this inferior clone. Tournament Fighters leaves the impression that Konami was just trying to cash in on the 2D fighting craze of the early 90’s and the oft-milked TMNT license at the same time. It isn’t a terrible game, but it has nothing going for it to make it stick out from the pack, and it lacks the precision and tight gameplay of the game it’s trying so hard to emulate. Buy TMNT: Tournament Fighters on GameGavel or Amazon. Tagged Fighting, Konami, Review, SNES, Super Nintendo, Teenage Mutant Ninja Turtles, TMNT, Tournament Fighters. Bookmark the permalink.